Shopping for a unique accessory to complete your Halloween costume? 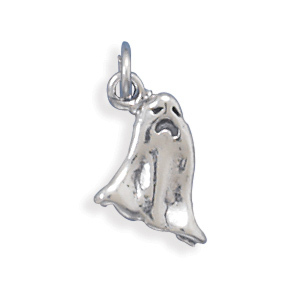 You may want to consider this frightening ghost charm! This brand new charm is a genuine .925 sterling silver charm measuring approximately 10 millimeters by 17 millimeters with an oxidized finish to enhance the ghost's details! This ghost charm will add the perfect touch to just about any Halloween costume! FREE FIRST CLASS SHIPPING IN THE U.S! Buyers must finalize their purchase a minimum of two weeks before Halloween to insure delivery in time for Halloween! We have a huge inventory of unique Halloween jewelry accessories so be sure to contact us for the link to our daily updated discount catalog to view our entire collection!